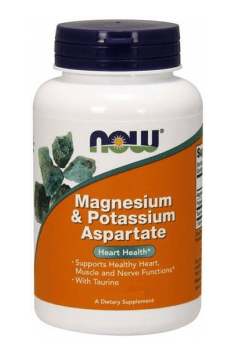 Magnesium & Potassium Aspartate 120 caps. As a dietary supplement, take 2 capsules 1 to 2 times daily with or between meals. It is recommended to start proper supplementation of magnesium and potassium in the period of strenuous mental as well as physical activity, also after reaching the age of 50. Symptoms such as fatigue, muscle weakness, numbness or arrythmia may account for a deficiency of one of these elements. To avoid electrolyte deficiency, it is suggested to provide adequate fluid supply and follow a proper diet. Potassium aspartate - a highly assimilable form of potassium, mainly encountered in dietary supplements in combination with magnesium aspartate. It is used in order to effectively increase the supply of this mineral in a diet. It is especially important for physically active people, as it is indicated that intensive physical effort is conducive to disposing of potassium ions from the organism. Diet rich in salt is also conducive to its deficiencies. Potassium is the most common cation present in the intercellular fluid, thanks to which it is incredibly important to maintain the organism’s homeostasis. It is an electrolyte, ensures optimal permeability of cell membranes, facilitates efficient biochemical transformations in the cytoplasm. It is also an activator of many enzymes, due to which it conditions the course of many reactions in the organism. Insufficient supply of potassium leads to water-electrolyte disorders in the organism. It mainly gives symptoms of general weakness and increased fatigue, it decreases cognitive functions motor coordination. It negatively influences the work of heart, may disturb the functioning of the whole muscle system. In hypocalcemia, nervous system disfunctions may also appear.